A 38 North exclusive with analysis by Frank V. Pabian. As the upcoming closure of North Korea’s Punggye-ri Nuclear Test Site appears to be on track, there are still lingering questions about the layouts of the various test tunnels. 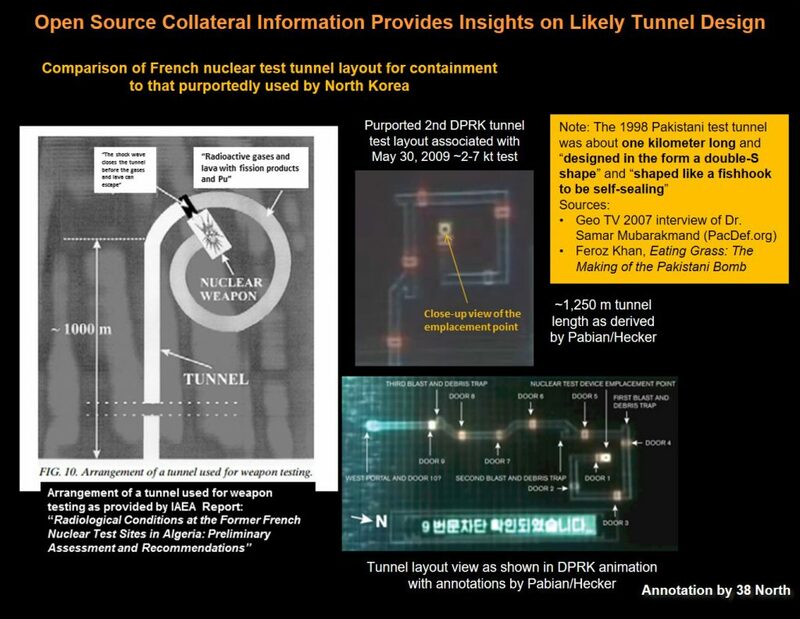 While possible tunnel schematics have been proposed, a close study of commercial satellite imagery and other open source information suggests that the North Koreans likely modeled their nuclear test tunnels after older designs used by the US, France and Pakistan. This includes a “zig-zag” tunnel terminating in a “fish hook” shape to assist with “self-sealing” after detonation, with “blast traps” located at various intervals along each tunnel. What makes the tunnel layout under Mt. Mantap unique is that it appears to include two separate tunnel systems originating from the North Portal, together having at least five branches (one for each test). The tunnel systems originating from the South and West Portals, while they have not yet been used, likely involve similar zig-zag patterns with multiple branches ending in fish hook shapes. North Korea established its only known underground nuclear test site 17 kilometers north of the village of Punggye-ri, at the foot of Mt. Mantap in North Hamgyong Province. To date, six tunnel-emplaced (underground) nuclear explosive tests have been conducted from this site: October 9, 2006; May 25, 2009; February 12, 2013; January 6, 2016; September 9, 2016; and September 3, 2017. With each test, the effective explosive yield was progressively larger, starting from around a 1-2 kiloton yield during the first test in 2006 to approximately a quarter of a megaton yield with the last test in 2017. The Punggye-ri nuclear test site is comprised of four separate tunnel systems, identified respectively as the East Portal (sometimes referred to as Tunnel No. 1), the North Portal (Tunnel No. 2), the South Portal (Tunnel No. 3) and the West Portal (Tunnel No. 4). Of these four portals, the East Portal was used in 2006 and evidently abandoned shortly after that single use due to contamination. Figure 1. 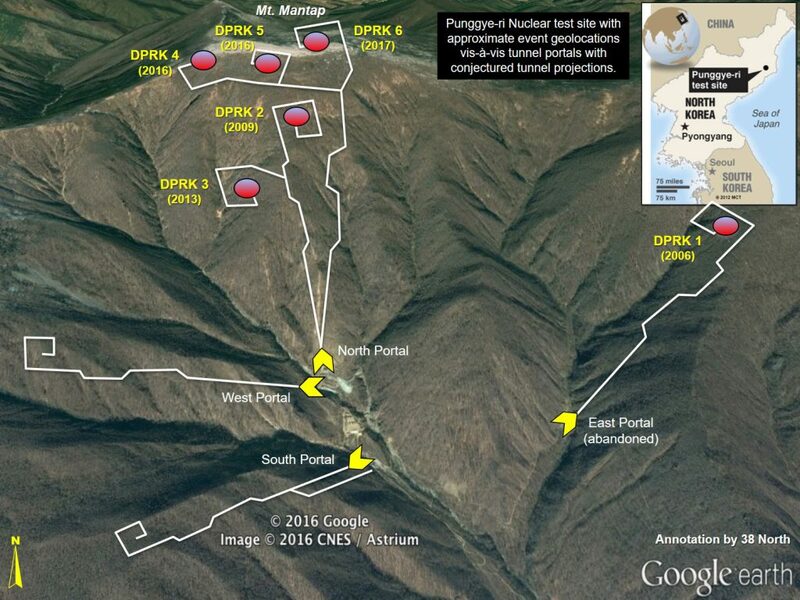 Overview of the four portals at the Punggye-ri Nuclear Test Site with conjectured tunnel layouts. Image: Google Earth, annotation by 38 North. Recent advances in seismic monitoring combined with both commercial satellite imagery and synthetic aperture radar imagery have made possible a very precise determination of the test locations with a resolution of only a few hundred meters. Based upon evaluation of the data now available from those sources, it can be determined that the North Portal was used to conduct all five of the subsequent underground nuclear tests. The use of a single tunnel entrance for multiple tests necessitates separate branches (“drifts”) further down the tunnel, each likely involving self-sealing closure designs, such that the resulting emplacement points (epicenters) could have been spaced roughly 350-500 meters apart, as has been determined through seismic relative location calculations. While five of the most recent nuclear tests were conducted from the North Portal, the 2009 and 2013 tests were conducted via the original tunnel system that was subsequently sealed-off after the 2013 test, likely due to contamination, given a detected radionuclide emission. At that time, an entirely new tunnel system was excavated at the North Portal (generating a new spoil pile), which likely bypassed the original tunnel and provided the basis for conducting the following three tests, again likely involving a branching tunnel system originating from the North Portal. The South Portal has at least one primary tunnel entrance and possibly another, likely smaller, secondary tunnel entrance nearby. No test has been conducted via the South Portal to date, but excavation activity ended in late 2013. As a result, tunneling has been presumed to be complete and the tunnels have likely been maintained for future use. There is sound reason to believe that North Korea utilized a zig-zag tunnel system with fish hook, self-sealing, closures at the ending emplacement points (Figure 1), given that such a layout was depicted in a North Korean propaganda animation video released after the 2009 test. That layout, which included additional appropriately designed blast traps, is quite consistent with the layout of the tunnel used in the first US underground nuclear test known as “Plumbbob Rainier” in 1957 (Figure 2). Figure 2. Schematics of the 1957 US Plumbbob Ranier nuclear test tunnel design. Photo: National Nuclear Security Administration. The general zig-zag tunnel layout with a fish hook for self sealing at the end is also consistent with the test tunnel layouts for the French underground nuclear tests in Algeria in the early 1960s (Figure 3), as well as with a published description of what was used for a Pakistani underground nuclear test in 1998. Figure 3. 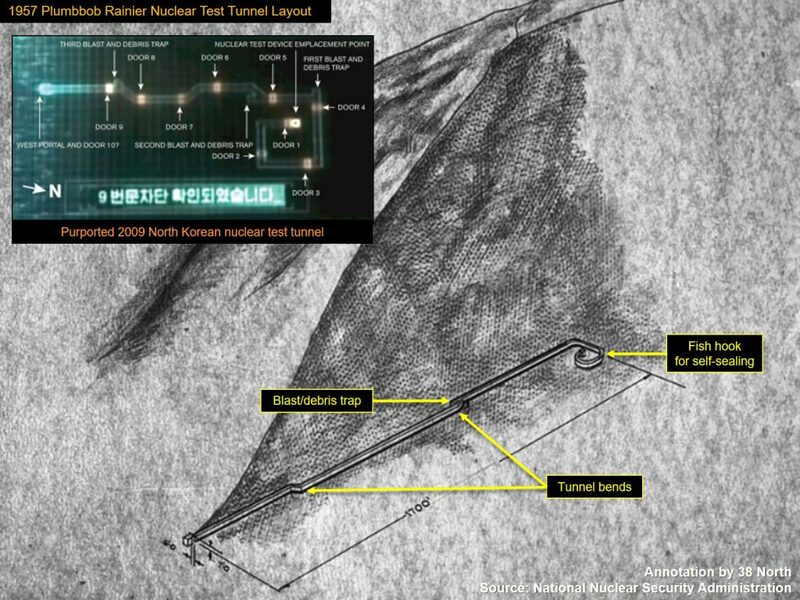 Comparison of North Korean nuclear test tunnel (2009) with French nuclear test tunnels (1960s). Left inset: IAEA; top right inset: frame grab from “The Country I Saw,” Jeffrey Lewis/38 North; bottom right inset: “Contemplating a third nuclear test in North Korea” by Frank V. Pabian and Siegfried S. Hecker, Bulletin of the Atomic Scientists. Figure 4. 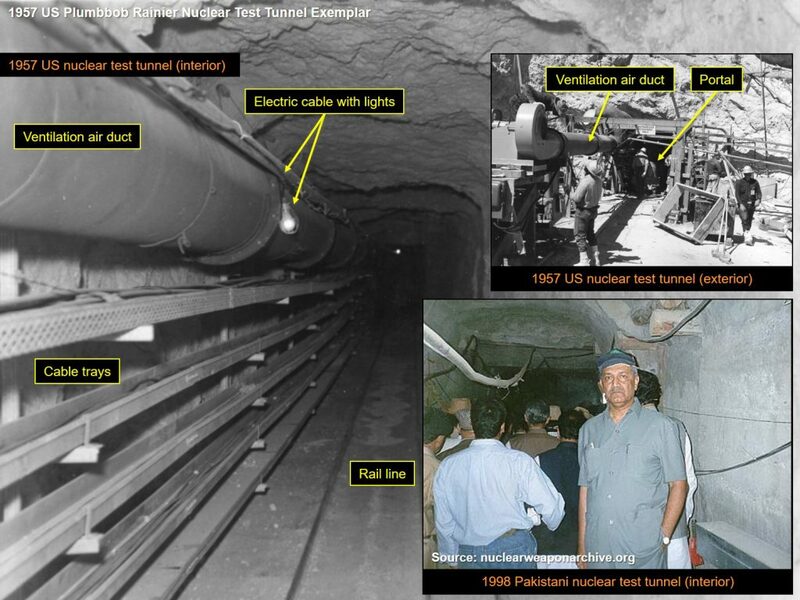 Interior and exterior views of the Plumbbob Rainier test tunnel compared with an interior view of the Pakistani test tunnel in lower right corner. Photo: National Nuclear Security Administration. A. Q. Khan inset photo: The Nuclear Weapon Archive. However, analysis of the available open source data (seismic data, commercial satellite imagery, radar data, and a CTBTO radionuclide detection report in 2013) suggests that while only one portal (the North Portal) has been used for all of the five tests conducted under Mt. Mantap, the tunnel layout accessed by that portal is more complex than the one used in the first US test. The key difference is that there have been two separate tunnel systems originating at the North Portal, each having at least two or three branches (“drifts”) respectively. The West and South Portals at Punggye-ri would likely be similarly configured to the North Portal, containing multiple drifts ending in fish hook shapes. However, the South Portal could also contain an auxiliary parallel access/service tunnel via a secondary entrance that is thought to be located 50 meters southeast of the primary tunnel entrance. Following the February 12, 2013 test, radionuclides were detected at two CTBTO monitoring stations. “Two radioactive isotopes of the noble gas xenon were identified, xenon-131m and xenon-133, which provide reliable information on the nuclear nature of the source. The ratio of the detected xenon isotopes is consistent with a nuclear fission event occurring more than 50 days before the detection (nuclear fission can occur in both nuclear explosions and nuclear energy production). This coincides very well with announced nuclear test by the DPRK that occurred on 12 February 2013, 55 days before the measurement.” “After an underground nuclear explosion, radioactive noble gases can seep through layers of rock and sediment until they escape into the air. Alternatively, the radioactivity may also be released by man-made activities at the test site.” http://www.ctbto.org/press-centre/press-releases/2013/ctbto-detects-radioactivity-consistent-with-12-february-announced-north-korean-nuclear-test/. A historical film documenting various aspects of the tunnel layout and features employed in the US “Plumbbob Rainier” underground nuclear test can be viewed here: https://www.youtube.com/watch?time_continue=418&v=F6438AsuA6Y.